ColorPicker is a graphical software component which draws a color palette used to pick a specific color. There are two types of palettes used – Office and Professional. The Office color palette is the one used by applications of Microsoft Office suite. The professional one is similar to Adobe Photoshop’s palette. 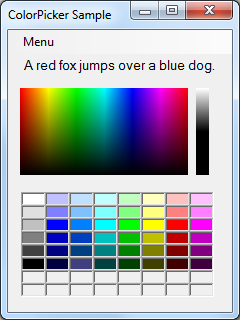 ColorPicker can also display a pre-defined set of colors from which the user may choose one. All important properties and settings can be set during design-time using Visual Studio’s designer.